An explosion at the main square in the Moroccan city of Marrakesh has killed at least 14 people and injured 20. 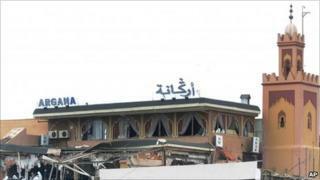 The blast tore through the Argana cafe in Djemaa el-Fna square, a popular tourist destination. Initial reports had pointed to an accidental gas explosion, but officials now say they believe it was "criminal". Hugo Somersham-Jones, who owns a hotel nearby, told the BBC's Focus on Africa what he saw. It was just before 12 o'clock and we heard a very loud explosion. Very quickly, we started to see debris fall from the sky. We're only about 100m from the Djemaa el-Fna and the cafe Argana itself. My girlfriend and I then rushed out to the square to see what had happened and, to be frank, came across a terrible scene of carnage. The first floor of this very popular Marrakesh cafe was pretty much demolished and the roof collapsed. I saw many bodies in the cafe itself and some very brave waiters and members of the public were up on the first floor trying to help people put out some of the fire and pick people up. It was clear that a number of the people they were carrying away were lifeless. My manager saw a lady who had lost an arm. On the floor surrounding the cafe out on the street - not just the immediate area outside, but maybe 50m to 75m away - there were footmarks of red blood.